Crete, Nebraska - A $10,000 grant from the Nestle Purina PetCare Foundation is helping renovate the Crete Youth Cabin. The grant will be used by the Crete Youth Cabin Association to replace deteriorating roofing on the cabin roof and out buildings. The renovations are expected to be completed as soon as weather permits, probably before June, 2017. The roof replacement is part of a larger, five-year restoration campaign by the Crete Youth Cabin Association so that the cabin will serve youth activities for the foreseeable future. “We couldn’t be happier about this grant. 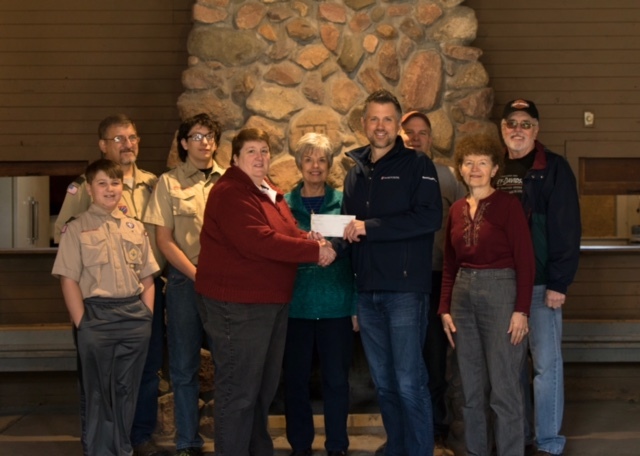 Generations of Crete natives have memories of time spent at the Crete youth Cabin, and this grant will help insure that many future generations will be able to enjoy the cabin too,” said Sen. Laura Ebke, chairman of the Crete Youth Cabin Board of Directors. The rustic cabin containing a grand stone fireplace was built in the 1930’s as a private hunting and outing lodge. In 1956, the B.G. Miller family donated the cabin and surrounding 38 acres of wooded land through which the Big Blue river winds to what is now known as the Crete Youth Association in the form of a perpetual lease. Through the years since the Miller family donation, the cabin has been used by countless scouting organizations, not only from Crete, but also around a wide area for weekend outings and camp-outs. It also serves other community functions, and is available to private and corporate users to rent for picnic and retreat functions, nature outings and meetings. Nestle Purina also values its longtime partnership with other area organizations, including, Special Olympics Nebraska, Crete Library Summer Reading Program, Crete Schools Backpack Program, and United Way.